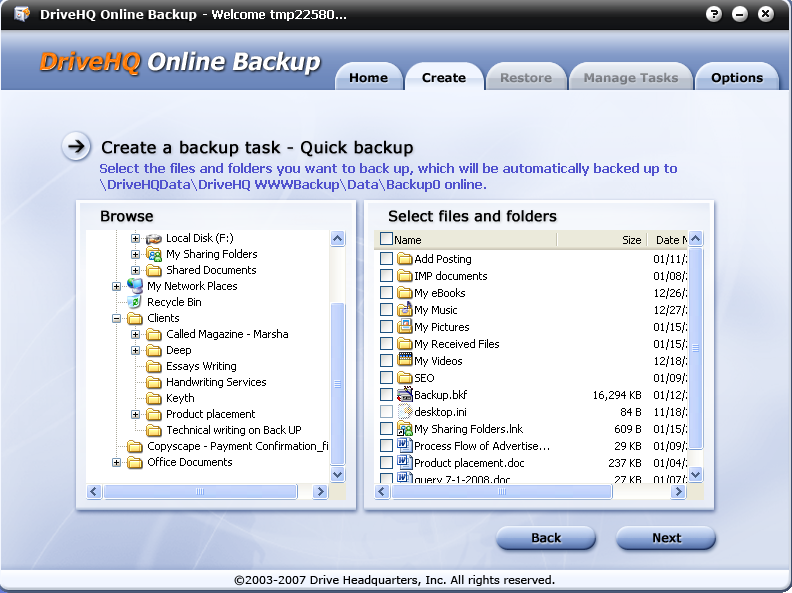 How to backup data using DriveHQ Online Backup software? It is always beneficial to learn about the importance of the data backup. There are various possibilities wherein you can lose your important data at any time due to attack of viruses, Failure of power, Hard disk failure etc. Depending upon the importance of data; backing up the data is essential. 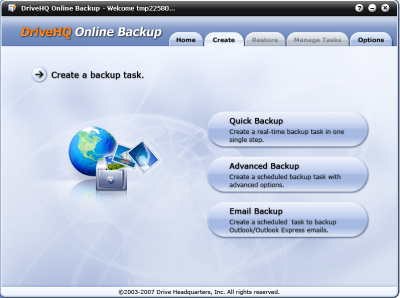 If you wish to have an online backup then DriveHQ is a software which can help you to create online backup of your Documents, Outlook, Registry, E-mail, Messenger and System backups. 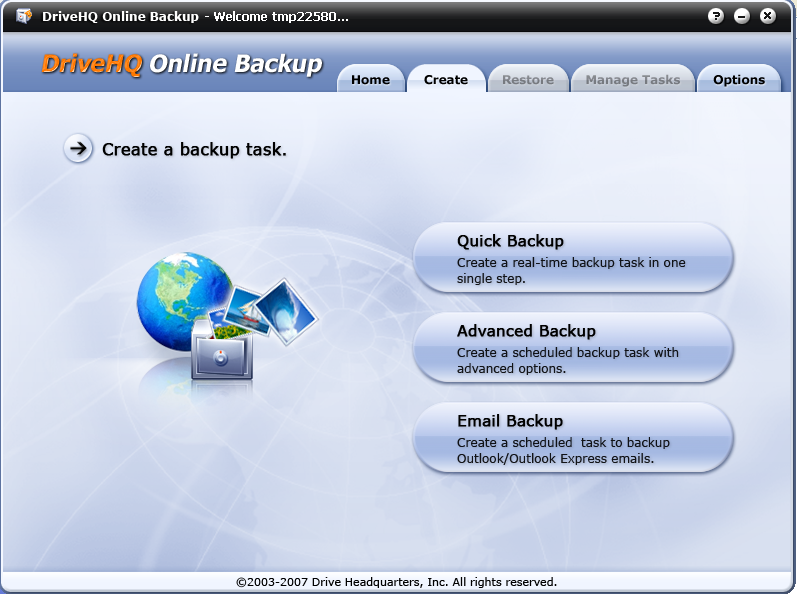 Using DriveHQ Software user can directly back up all the data online and there is no need to have any backup devices. Signup the DriveHQ account for free and Download free version of DriveHQ from www.drivehq.com/Backup, this takes few minutes to install it on your system. The free version comes with a limitation of 50 MB data and can perform maximum two backup operations. After installing the software on your system, select DriveHQ online backup from the programs files or start menu and follow these steps to backup your data, emails, and many more. Select ‘Create a backup task’ on your welcome screen. As shown in the ‘Figure 1’, you will come across three options viz., Quick Backup, Advanced Backup and Email Backup. 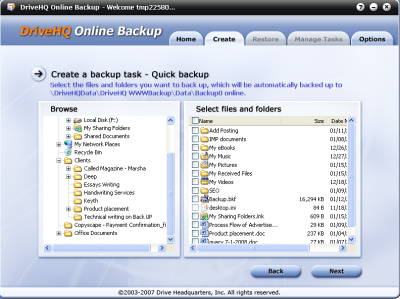 In the advance option, you can select the back type, Real-time Backup or Scheduled Backup. This will help you to perform backup operations on real time basis or on scheduled time. For Email Backup task, select the source of the email such as outlook express, Microsoft outlook or any other email clients. Click Next; the backup operation will start automatically. DriveHQ provides safe and secure backup solution. It is a user friendly application and with a single step, user can backup all the important data online. « How to backup System State data?